1. Before you implemented EmberEquine, what were you using for your mare exams and recordkeeping? 2. What were the problems with your old equine ultrasounds and your recordkeeping system, and how did EmberEquine address those problems? “Where to start … On my old ultrasound: I had limited probe options, the screen was pretty difficult to see, the ultrasound image itself wasn’t clear, and I had to do quite a bit of estimating and guess-work. With my recordkeeping process, there were a lot of problems. Aside from the fact my paper records were being used in a pretty messy environment, it was also a challenge to keep them updated on the spot. Because of my booked schedule, I was often going from appointment to appointment. I had to go back at the end of each day and try to remember all the procedures I performed so I could create all my invoices. I was also in trouble if I ever left my book of records anywhere. It was pretty difficult to keep everything in order without them. Honestly, I think I was content with my old system for so long because I didn’t know what else was out there. EmberEquine has completely shifted the way I run my practice. From an equine ultrasound standpoint, the 4VetJ gives me awesome screen visibility with a clear, bright image. The touchscreen measurement feature allows me to take exact measurements and eliminate estimating. And the recordkeeping functionality of the Mesa 2 with the Ember software has been a game-changer. I’m able to quickly enter all the mare info into the software, attach the measured images, create a follow-up appointment, and create an invoice in a matter of minutes. I also feel like it’s helped me remember things to put on the invoice, so it’s saved money that way. 3. How has EmberEquine changed the way you run your practice? “I don’t spend any time on the computer after work. Before Ember, I was typically spending around two hours updating my records and putting invoices from that day together. Everything I used to have to do after work can now be done at the appointment before I drive away. The follow-up appointment and billing codes can all be done right there. 4. What are some of your favorite features of EmberEquine? “The software is extremely intuitive. I didn’t feel like I had to learn some complex software or retrain myself on how to run my practice. It’s what I’ve been doing for the past 24 years – just digital. It really does feel like it was designed by vets, for vets. I’ve really enjoyed its ability to share information with others. Another thing to point out would be the Mesa 2 can completely replace your current office computer. I got rid of my office computer about a year ago and now I just dock the Mesa 2 and work on my monitor. 5. How easy was it for you to implement EmberEquine into your existing workflow? 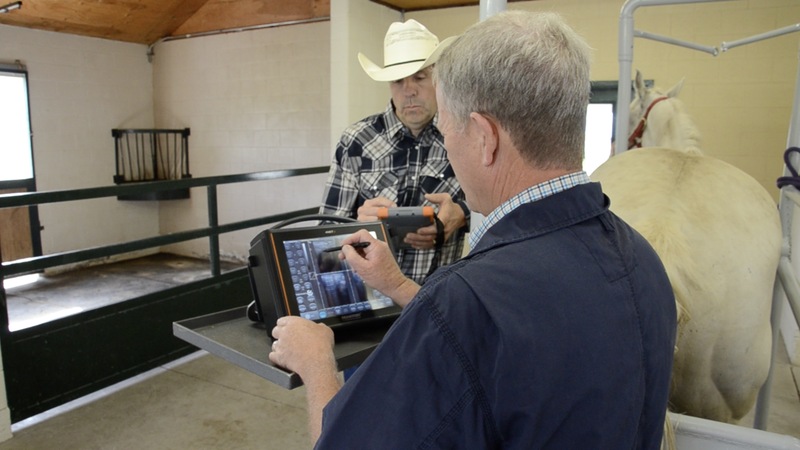 If you’re an equine veterinarian or breeding farm manager interested in the EmberEquine Ultrasound and Recordkeeping Solution, call us at 435-753-1881 or email sales@junipersys.com. We’re currently offering a 30-day free software trial. This trial gives veterinarians the opportunity to try the software, without any commitment. Click here for your activation code. Have a quick question? Drop it in the comments below and we’ll get you an answer as soon as we can. Nice article. Keep sharing like this. Great Article, Keep sharing good stuff like this!